The ability to conduct persuasive presentations with confidence is an essential management skill. A private one-day presentation skills coaching clinic affords you the opportunity to address your personal presentation skills requirements in a candid and confidential environment. The clinic is facilitated by Stuart Ayling, an experienced speaker and trainer in presentation skills and Managing Director of Marketing Nous. Effective presentation skills to look good, sound great, and get a positive response. Stuart certainly provided me with an edge that moved my conference presentation from a likely mundane talk to an engaging high impact presentation. During your personal presentation skills coaching clinic you will learn how to successfully design and deliver effective face-to-face presentations; whether to boardroom groups, client meetings, presentations to staff or large conference audiences. Because the clinic session is personal and private, you can get feedback and suggestions from Stuart on delicate issues that your colleagues and friends will not usually comment on such as mannerisms, speech, and posture. Plus, you will get specific advice about your PowerPoint slides – changes can be made at the clinic – making it easier for you to deliver a great presentation. At the clinic there is no time wasted covering irrelevant topics. Your needs are individually catered for with discussion and practice centred around your specific presentation requirements. Clinics may be held on your premises, or off-site in central CBD locations in capital cities ensuring easy access, minimising distractions and potential disturbances from your office, phones, and colleagues. Our share price jumped by 60% over the two days I was presenting to investors. I used your ideas from the clinic and they really worked! Thank you. The clinic format is suitable for all presenters, even those with little previous experience in giving presentations. You will focus on your current presentation objectives, learn practical skills, and achieve significant personal progress. How to properly plan and structure your presentation. How to open with impact and grab audience attention. How to anticipate and manage difficult questions from the audience. The best way to use visuals. Tips and techniques for managing nerves, jitters, and anxiety. What to avoid when using modern presentation technologies. Tips and strategies for using PowerPoint so you don’t bore your audience. How to recognise personal mannerisms that can destroy your presentation. How to handle long questions and maintain control over your time. What to do if things go wrong. How to look cool, calm, and confident – even when you’re not! During your presentation skills clinic we’ll also cover subtle personal aspects such as how to use your hands, voice control and where to stand; as well as how to manage things like preparing the room and understanding what your audience needs. Thank you for your keen personal insights into my challenges, your gentle encouragement towards my recognition of them, and thus putting me on-track to their rectification. Pre-clinic review of your presentation material such as PowerPoint slides, handouts etc. Personal 5-hour coaching clinic, including delivery, critique, practice and improvement of your presentation. Video playback is used during the clinic to enable you to observe your own performance. 3-months direct access to the trainer. Post-clinic review session after an actual presentation (including review of video footage if available). Many coaching clinic clients have found that a multi-session program is more suitable, especially if there is a need to cover a number of presentation opportunities. Senior executives find this option very practical as they can apply what we cover during the clinic sessions to their actual meetings and presentation situations, which is reviewed at the following session. A program of 3 x 3.5 hour sessions is usually sufficient, although this can be altered to suit individual requirements. Please note: Clinics are offered by appointment only and are held in central CBD locations. Venue may be on client premises (if suitable room and privacy is available) and will be confirmed at time of booking. Cancellations by client with more than 14 days notice will incur a fee of 50% of tuition. Cancellations within 14 days of the confirmed clinic date are not refundable. I changed the PowerPoint’s as you suggested, and I could see my presentation really resonated with them. Thank you again for your wonderful help – it was very useful. All clinics are facilitated by Stuart Ayling, Managing Director of Marketing Nous. 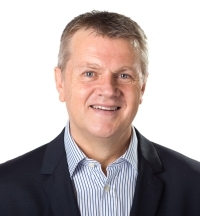 Stuart has over 20 years of insights from his business, sales, and marketing management roles and has many years experience giving presentations to small and large groups (from 2 to 200 people) at sales meetings, management meetings, educational presentations, conference sessions and training workshops. Stuart has also developed and delivered his own two-day presentation skills training program called ‘Presenting With Confidence’. This program is frequently customised for in-house training by leading national companies. Presenting management reports at executive level within national and multi-national companies. Presenting key note sessions at industry conferences. Presenting a variety of his own training programs and seminars. Being MC for conferences with audiences of hundreds of delegates. Presenting educational seminars to groups of business people. Conducting sales presentations to individuals and small groups. Lecturer and Tutor at University of Queensland Business School. Read more about Stuart’s experience as a keynote speaker. Below: Example of Stuart Ayling presenting at a national conference. If after you put into practice the skills and techniques presented at the clinic you don’t think you’ve improved your presentation skills and received an excellent experience, just say so. Great care is taken to ensure you receive maximum assistance to achieve your outcomes. But if you feel that hasn’t happened please let Stuart know and a full refund will be provided. To request your private presentation skills coaching clinic or to enquire about personal presentation skills coaching for your management team contact Stuart Ayling. Sales figures have increased by 20% on last year to date!! The team also continue to pick up new customers. Our sales results have increased since incorporating Stuart’s sessions into our sales conference and this has been during a downturn in the market. The content of the sessions was customised to suit our customer interactions, with a lot of preparation on the part of Stuart. Thank you so much for a brilliant session on Thursday. I think the format and content was ideal. We had a very positive result from involving Stuart in our Managers Conference last year. The training got us thinking more strategically about how the business is structured. It has really built our capabilities as a management team. Stuart was patient, flexible and knowledgeable. He took the time to truly understand our business. The best thing is that I now have a road map of specific marketing activities that can be implemented with confidence. The participants immediately felt engaged as Stuart demonstrated his understanding of our needs and challenges. With only one day we had a lot of material to cover and Stuart created a positive learning environment for all involved. Bad ideas are expensive in business however with Stuart Ayling, it was money very well spent. By the next week, sales of this product had doubled from 10% of all new sales to 20%. The extremely cost effective session with Stuart paid for itself within the first week. We have already seen a new client on board as a result of the two-day workshop. Stuart put the sales training across in a way they could accept as a part of our service offering with out them feeling like “salesmen”. We were impressed by the approach of Stuart and the simplicity of the program without the hype generally associated with these courses.